Romo is an underrated quarterback that will be forced to throw even more with the Dallas putrid defense. 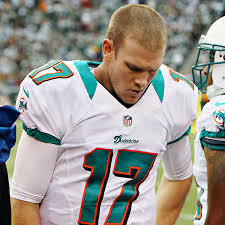 Will Tannehill excel in a high paced offense similar to Philly? If the answer is yes, he might actually be worth his late first round rookie pick selection in 2013. I have my starters’ backups, for now, and I invested a few dollars on the waiver wire to get Brees’ athletic backup. Can you already tell I’m happy that Darren Sproles went to the Eagles? So I own every roster worthy Saints back and then some. Between the top three Saints backs, I should have a solid starter. Williams is old and Tolbert is more of a goal line back, but there are at least bye week possibilities. If Bradshaw can somehow overtake Trent Richardson at some point this season, worrying about this position will be an afterthought, but is not very likely. I traded for Dunbar sending Houston backup Andre Brown for him during the May rookie draft. James on my team still haunts me, because I traded for him right when Doug Martin went down and soon after James broke his ankle. Thompson and Tipton are fliers. This receiving corps is a glaring weakness with only one super strong starter in Garcon. Hartline can catch a ton of passes, but doesn’t score very often. I’m hoping that Williams steps up this season and that Douglas remains relevant in The Falcons three wide sets. Brown continues to be a disappointment and the Huff selection was a hopeful pick that he will earn some playing time as I do not trust Jeremy Maclin. Huff played in Kelly’s offense and looked good in Mobile this past winter. Hopefully there will be some decent veteran production between Austin, Washington, and Simpson, but I’m not holding my breath. Beasley surprised in a couple of games in 2013, can he do it again? Witten is old, but should be productive for another two years. Bennett flashed last year and might be more involved this season. Toilolo won’t see the same targets Tony Gonzalez did, but might be a solid depth guy. Bostick and McDonald are two players that can’t seem to get out of their own way. Depending on the preseason, I might need to cut one or two of them. I have two kickers with different byes, yay! Marks is a solid player who doesn’t offer a lot of upside. Melton is coming off a year on the injured reserve. Hopefully the Dallas DT can return to form and finally I got hit with a bye week issue as both of them are off Week 11. Once again I have a solid squad with no superstars. Long and Robison are steady and Osi is so old, he might not be relevant this year or in the future. Bennett should improve with another season in Seattle and less health concerns. Thornton and Taylor have a chance to improve on last year’s numbers. Greenway and Timmons are both solid LB2s. Hali, if he stays healthy, is a good pass rushing LB3. Brown and Moore are two young upside backers that might be every down starters on the inside or they could just be wasting roster space. Lamur spent all last season on injured reserve, but may be a great fit at SLB for the Bengals. McClain is a pure depth player and Coples is a converted DE who might never be fantasy relevant. I like my corner backs as much as you can. See my kickers section. All three of my safeties are great tacklers and have big play ability. Thomas is the anchor of his defense. Weddle can also return punts which gives him a little more juice in this league. Mitchell goes to the safety centric Steelers, which might even increase his production higher than last year’s. Team Outlook: 32 teamers are hard to predict. I was a nose hair from making the playoffs last season. This team should squeak in, but barely.